Dry to moderate moisture. Prairies. Full sun. This is a hairy, erect, perennial forb that rises on one to five stems from a deep, woody, often branched taproot, and tuberous main roots. The taproot is fragile and can extend 4¾″ to 6½″ deep. 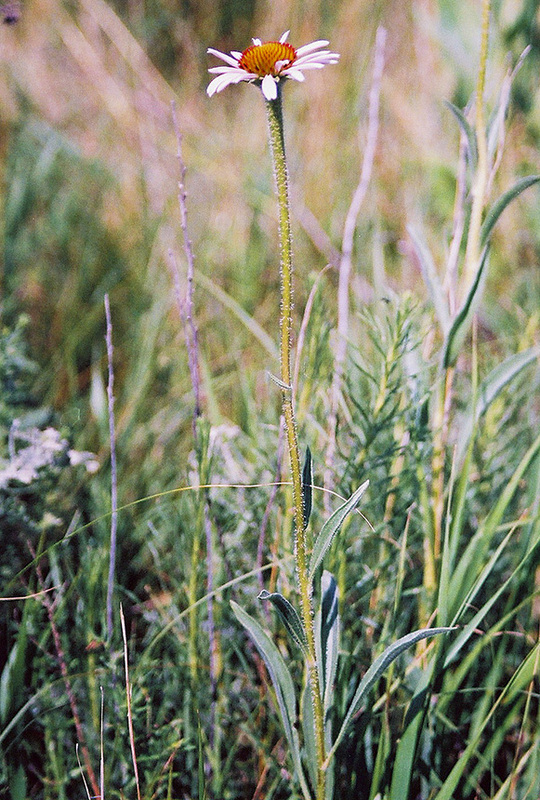 The stems are erect or ascending, green to purplish, round, and mostly unbranched. They can be 4″ to 27″ in height, but are usually no more than 20″ tall at maturity. They are finely ridged and sparsely to densely covered with stiff, spreading, 1 ⁄32″to 1 ⁄16″ long hairs. Basal leaves are long stalked, the leaf stalks up to 4¾″ in length. The blades are narrowly elliptic to lance-shaped, long tapered or narrowly angled at the base, and tapered to a sharp point at the tip. They are 2″ to 10″ long and ⅜″ to 1½″ wide, about 5 to 20 times as long as wide. They have usuallt 3m sometimes 5, prominent main veins. The upper and lower surfaces are rough to the touch and moderately to densely covered with stiff, mostly spreading hairs. The margins are untoothed and usually have a fringe of spreading hairs. Stem leaves are alternate. Lower stem leaves are long-stalked, linear to narrowly lance-shaped, 1½″ to 6″ long, ¼″ to 1½″ wide, and otherwise similar to basal leaves. The leaves become smaller and shorter stalked as they ascend the stem. 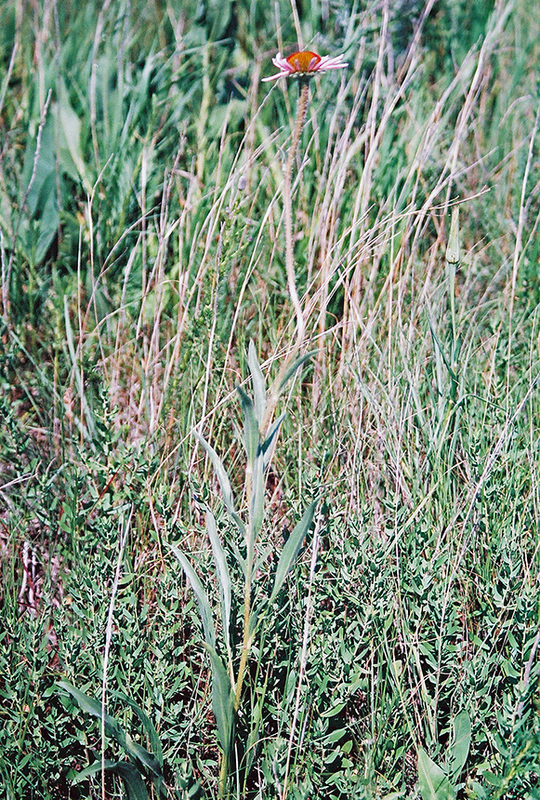 Upper stem leaves are stalkless, ⅝″ to 1¼″ long, and ⅝″ to 1″ wide. The inflorescence is a solitary flower head on a long stalk at the end of the stem. The flower stalk is leafless, 4″ to 12″ long, and covered with stiff, spreading hairs. At the base of the flower head a whorl of 17 to 30 bracts in three or four overlapping series forming a ½″ to 1½″ in diameter, cup-shaped involucre. The bracts of the involucre (phyllaries) are green, narrowly lance-shaped to lance-shaped, ¼″ to ½″ long, hairy, and fringed with hairs. The outermost phyllaries are egg-shaped and spreading to bent backward above the middle. 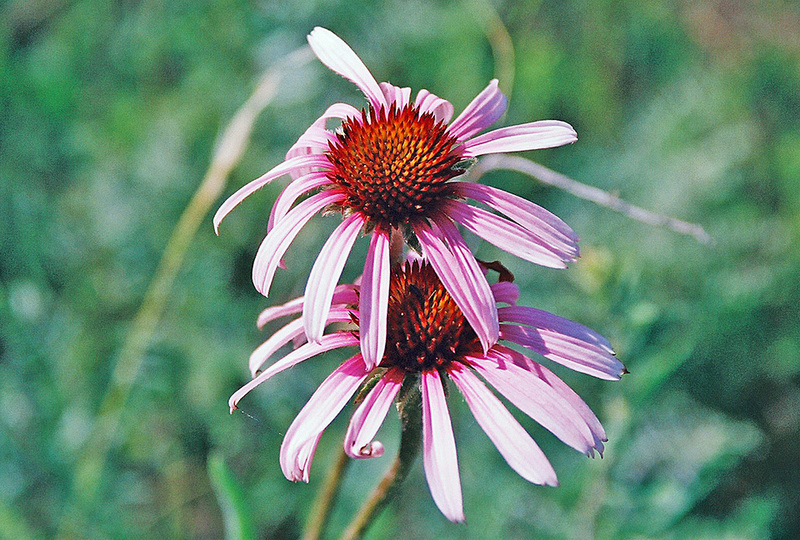 The flower heads are 1½″ to 2″ in diameter. There are 8 to 21 ray florets and 200 to 300 or more disk florets. The disk is cone-shaped, ⅝″ to 1¼″ tall, and ¾″ to 1⅜″ in diameter. 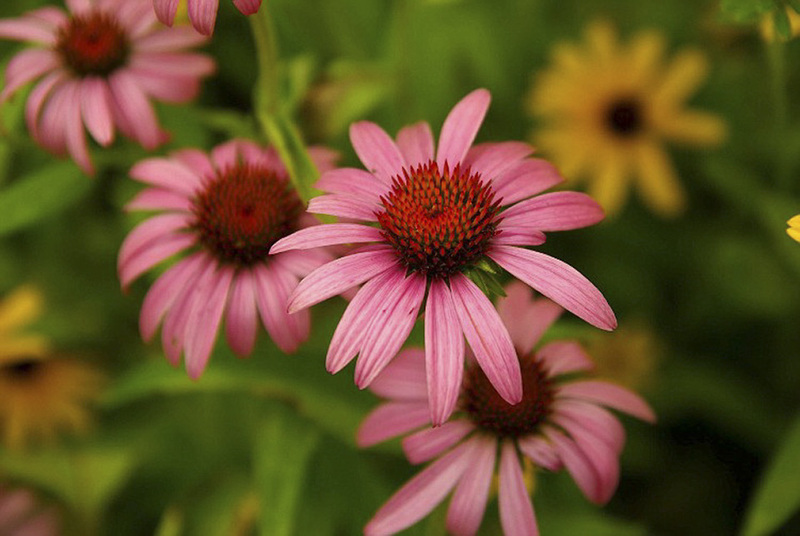 The ray florets are pink to purplish, ¾″ to 1⅜″ long, 3 ⁄16″ to 5 ⁄16″ wide, and mostly spreading. They are about as long as the disk is wide. The disk florets have five petals fused at the base into a yellow to green tube then separated at the tip into five dark purple lobes. Each disk floret is subtended by a thin, dry, bract. The bracts are ⅜″ to 9 ⁄16″ long, hardened, and sharply pointed with a spine-like tip. They are noticeably longer than the disk corollas. They are usually dark purple at the tip. They remain on the plant at fruiting time. The fruit is a dry, wedge-shaped, 4-angled in cross section, slightly flattened, ⅛″ to 3 ⁄16″ long cypsela with a crown of feather-like hairs attached to one end. It is tan toward the base, banded with dark brown toward the tip. 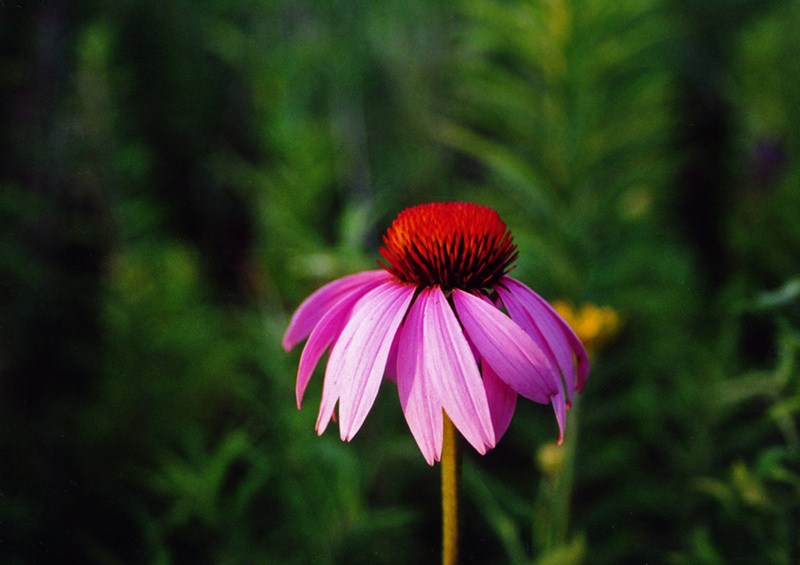 Eastern purple coneflower (Echinacea purpurea) is a taller plant, up to 48″ in height. The leaves are wider, only 1½ to 5 times as long as wide. The leaf margins are toothed. The hairs on the leaf surfaces are appressed, not spreading. 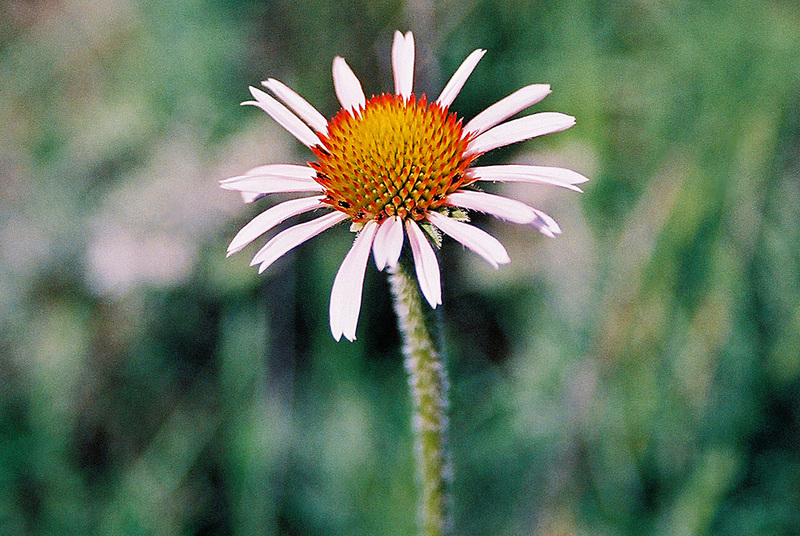 The flower heads are larger, up to 4″ in diameter.